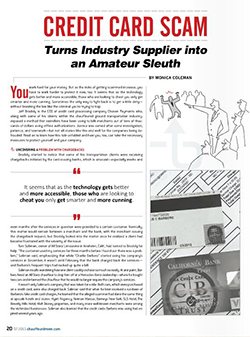 In this month’s Chauffeur Driven Magazine, there was a great article on one of the biggest fraud stings in our industry. Our own President, Jeff Brodsly and the Chosen Payments team were instrumental in foiling an ongoing credit card scam brought about by Charlie Barbero. His “M.O.” was using expired credit cards to stay at high-end hotels and book luxury chauffeured transportation. When the card would come up as declined when the company would attempt to run the card, Barbero would claim to contact the credit card processor company, and would provide a so-called “offline authorization,” which was fake. The credit card processor would deposit the money in the account of the company as normal. Weeks or months later, the bank would discover the error, leaving the company on the hook for upwards of thousands of dollars with Barbero long gone. In late June, Barbero pleaded guilty to identity theft and possession of a stolen vehicle. This story, as you can imagine, has generated a great deal of local media interest. In this video clip, a local Los Angeles television news show, News 10, covered the case, including an interview with Jeff Brodsly. You can see the video clip of the story here. To read the article in this month’s issue of Chauffeur Driven Magazine, please click here.